"Hidden in the haze of the sea are creatures so immense and so mysterious,they seem unreal." There's little argument that whales hold a great amount of fascination for many people. It's hard not to admire animals that live so comfortably in an environment completely resistant to mankind. They seem to bear silent witness to a multitude of mysteries in the depths of Earth's oceans, seeming extremely wise and powerful. The all-too-short IMAX documentary Whales: An Unforgettable Journey delves into the lives of these profound creatures providing a well-balanced, expertly filmed nature experience. Narrated by Patrick Stewart, the film essentially tells two short stories. One half of the film deals with the behavior of Right Whales, and the other half covers the migratory patterns of Humpback Whales. Right Whales, as we learn, earned their name for being the best whales to hunt, therefore the "right" whales. Apparently, Right Whales are rarely filmed or interacted with, making the early portions of the film rather interesting. The long travels of Humpback Whales from warm waters into the seas near Alaska comprises the bulk of the film and this is where the main focus resides. The narration and style of the film wisely balances very light amounts of biological science with informational anecdotes. Nothing is weighed down with seriousness, nor is it made too goofy and lighthearted so as to ruin the mood. 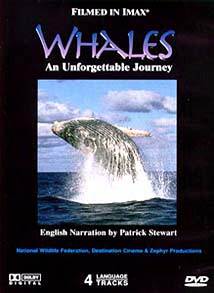 Overall, the tone of the film is one of silent awe at the behavior of whales. The photography is simply amazing, with some of the most impressive whale footage I've ever seen. Creative camera techniques provide some interesting methods of filming sea-life, and the expertise of underwater cameraman Al Giddings (a legend in the film industry) is definitely felt. The documentary certainly delivers its promise of Whales, as the film never breaks its attention from the sea creatures. Despite a few shots of humans interacting with the them, as well as narration from biologists, at no point is camera time given over to a human being for the point of allowing them to "star" alongside the whales. In another departure from typical nature films, Whales does not beat you over the head with messages about how difficult whale life is. While death is certainly a specter over the long journey they must make to migrate, the film handles the subject tastefully, rather than resorting to gory footage of murdered whales or something similar. There are some IMAX nature films I've seen that feel somewhat rushed or not very exciting, however, this is not the case here. The obvious effort in creative, powerful filmmaking with this format is plainly evident. This must be a monster spectacle in an actual, full-size, IMAX theatre. Image Transfer Review: Whales is presented in its original 1:33:1 aspect ratio on this disc. Overall the image is extremely impressive, with rich colors and clear, artifact free underwater shots. The source print, however, does have a good deal of minor flaws such as scratches, holes, and grain. This doesn't come as a big surprise considering how delicate IMAX film is, but it does take its toll on a few scenes, especially in the beginning. None of this is distracting, however, and the image quality where it counts is extremely well mastered, without compression problems or background shimmer. Audio Transfer Review: An excellent Dolby 5.1 soundtrack accompanies this film, and helps enhance much of the dramatic content. Though mostly front channel oriented, the track has very good clarity and frequency range, making it very theatre-like. Since much of the movie takes place underwater, lots of surround water effects have been added to draw the viewer into the scene, and Humpback whales singing provide a very interesting, multi-channel experience. Patrick Stewart's narration is firmly planted in the center channel, but seems a little unbalanced and loud compared with the rest of the audio at times. The musical score also gets beefed up a bit thanks to the 5.1 treatment. Extras Review: Other than a theatrical trailer, the disc contains a 17-minute featurette about the making of Whales. The short is actually very well done and compliments the movie. The featurette explains much of how the filming crew built special rigs and cranes to position the IMAX cameras, and how they filmed the close-ups of whales. It also gives some brief, technical explanations of how IMAX differs from standard movie film. The overall presentation of the disc is rather nice, with full-motion menus that include full-motion scene selection. The keepcase is a Super Jewel that adds a nice, stylish look to the disc. The DVD is also not region coded, making it playable anywhere in the world. Whales is a good quality DVD that also results in a very family-oriented experience. Although short, the disc can easily entertain a broad spectrum of those interested in nature films. Recommended.